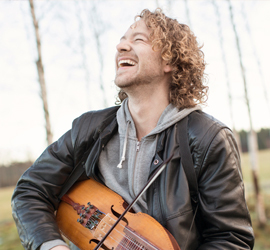 During recent years Erik has established himself on the Swedish folk music scene as a star amongst young nyckelharpa players. He comes from Västerbotten but moved down to southern Sweden to study the nyckelharpa, first at Eric Sahlströms Institutet in Tobo and then at the Royal College of Music in Stockholm. Today he lives in Stockholm and freelances and teaches full time. Erik got his first musical “kick” on the international folk music course Ethno in Falun, summer 1999. There he met young people from all around the world and understood that music is a language without boundaries. This has since characterised his way of approaching music and even his approach to the nyckelharpa. Apart from Nordic, Erik has in recent years been noted for his input in the flamenco company “Flamencos en route” in Switzerland, in the spelman’s duo with hardanger fiddler Olav Luksengård Mjelva as well as in different projects with saxophonist Jonas Knutsson. Erik is a musician continuously on the lookout for new impulses and challenges.